Terahertz time-domain spectroscopy (THz-TDS) is becoming the standard method for the characterization of novel materials e.g. for photovoltaics or in sensing and security. Since THz-TDS is capable of measuring an electromagnetic field in amplitude and phase—contrary to measuring a mere intensity—both the refractive index and the absorption coefficient of materials can be quantitatively determined at the same time. A complex mathematical treatment of transmission spectra is not necessary. 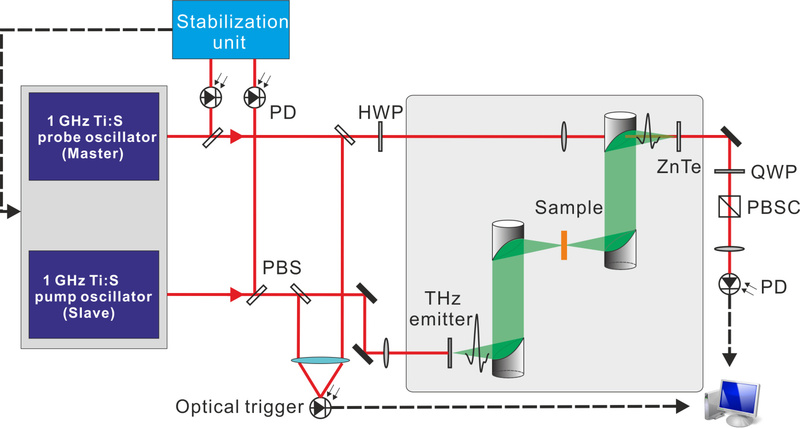 A typical THz-TDS set-up consists of a THz generator, a beam path with a focus in which the sample is placed, and a gated THz detector. However, the insertion of the sample into the focused THz beam will induce a focus displacement on the THz detector and affect the accuracy of the quantitative determination of the dielectric function of the sample. The group led by Prof. Thomas Dekorsy, from the University of Konstanz (Germany), investigated the defocusing influence on the quantitative determination of the refractive index and the absorption coefficient in focused THz-TDS setup based on asynchronous optical sampling (ASOPS) system. They demonstrated theoretical and experimental procedures to reduce the errors induced by the focus displacement. The results are reported in Chinese Optics Letters, Vol. 13, No. 9, 2015 (Q. Liang et al., Origin of potential errors in the quantitative determination of terahertz optical properties in time-domain terahertz spectroscopy). The propagation of the THz beam in the focused beam THz-TDS setup is described using the Gaussian beam and the ABCD method. In this way, a theoretical correction of the quantitative determination is obtained. A precise extraction of the refractive index and the absorption coefficient from the experimental data is achieved using a correction procedure. "Since the accuracy and metrology in the THz frequency range becomes more and more important, as time-domain THz analysis is becoming a standard tool in advanced material characterization, all effects influencing quantitative data analysis are becoming more relevant." says Prof. Thomas Dekorsy. Future work will concentrate on generating accurate data base values of THz properties of different materials of technological relevance.